The Sculpture Shock artists ambushed the public with work which breaks free from the clinical white cage of the gallery space and responds to a non-traditional environment. The second of these environments is ambulatory: a space without physical confines and in movement through time. The 2015 residency took place in the Sculpture Shock studio from 1 June until 11 September 2015. The work was shown as a pop-up performance from 10 - 13 September 2015 on the number 9 bus in central London. The winner of the Ambulatory category of Sculpture Shock 2015 is WILLIAM MACKRELL. Mackrell's intervention Gaps, glitches, and speed bumps popped up on central London's No. 9 bus route from Thursday 10 September to Sunday 13 September 2015. Gaps, glitches, and speed bumps was the culmination of his three month residency in the Sculpture Shock studio and attempted to activate the potential of ‘Ambulatory’ as site specific language from the live and nomadic setting of London’s bus network. If you missed Mackrell's live performance read Dave Beech's review on our blog or watch it online on the BBC website. See the full timetable and route they took here! Mackrell’s speculative actions balance between the plausible and the absurd, the possible and the unlikely. Mackrell employs this precarious way of working as an inherent characteristic of the everyday. A thought grows full of expectation, but from the outset grapples with the likelihood of not working out. There is a friction throughout all his works that attempt to articulate this contest between reaching a desire in the face of falling away. Works are setup to question how language as a construct frames human existence, with a particular interest in the collision and molding of sensory experiences that join nature and technological production. Influenced by the performance artists of the 60s Alexander Costello’s work takes on a responsibility to challenge and re-position perceived norms, systems, and place, often playing on notions of the absurd and the humorous. For the culmination of his Sculpture Shock residency, completed in September 2014, Costello's created a series of live performances on the waterways of London; Making Progress. For Making Progress, Costello called for all revellers in the absurd, believers in dead pan and those who delight in art's capacity for questioning accepted norms, to make their way to the canal banks of London as he became a white suited figurehead, attached to the bow of a barge as it wound its way through the waterways of London at 2 mph. The traditional use of these embellishments to signify the ship’s ferocity and strength was diminished and applied to a small barge. It was absurd. 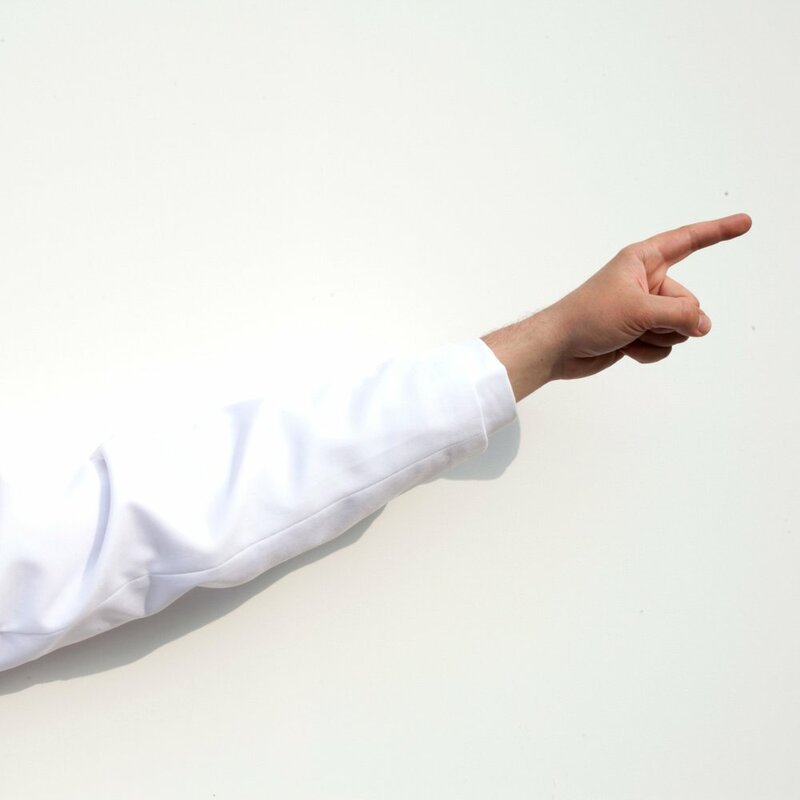 Wearing an impeccable white suit and intently pointing ahead, towards a questionably greater future, Costello’s idea of progress resided at several centimetres in front of his constantly pointed finger. Progress, something we relentlessly strive for and yet never realise, is of course absurd, as is our linear approach to life as we move from one thing achieved to the next. Through his work, Costello hopes to sow the seed of change by lodging future thoughts of change in the heads of the many that saw the figurehead pass. Costello's series of performances took place from the 4 to 7 of September 2014 as he travelled from Camden Lock to Tottenham Hale aboard Fordham Gallery, a travelling art venue located on a 60 x 12 ft canal barge. To read more about the performances take a look at our blog or see the full schedule and mooring locations here! Amy Sharrocks, a live and performance artist, created a series of live events in the public spaces around the borough. Her practice is socially engaged and often reaches out to marginalised groups and the general public. A Season for Falling addresses ‘falling: ‘the anticipation, the trip, the crash, the stumble, the joys of flying, the sharing of the story’. Sometimes using her own body, and often inviting groups to join her in acts of vulnerability, her aim is to understand falling as the natural way of things. She questioned the feelings of exposure and shame of being un-surefooted, the difficulties of being out of control and the liberation of inelegance. For Invitation to Fall, she asked 45 members of the public to fall publicly onto a crash mat in World’s End Place. For A Time to Fall, a very quiet and moving piece where each of the 15 participants fell individually without letting the others know when or how they were going to fall. The work examined the existence of trust that each participant had to feel for the rest of the group in order to allow themselves to let go, sure that they would be caught. Each participant fell into the others’ arms, was gently and carefully lowered to the ground and then helped up. The whole group progressed slowly along the beautiful pedestrian walkway, vigilant for the next fall.